MLB 4 Ball & Divot Tool Premium Gift Set (All Teams Available) - $25.99 - GolfersEdgeOnline.com - Best Golf Equipment On The Web! 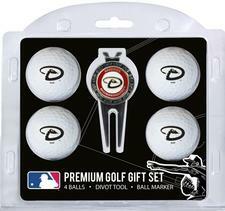 This official major league baseball gift set includes 4 golf balls with your favorite MLB team's logo, a metal divot repair tool in addition to a logo'd removable ball marker. If you have any more questions about the MLB 4 Ball & Divot Tool Premium Gift Set (All Teams Available); do not see the model you are looking for; need custom options; or prefer to not purchase online, then please call us at (630) 656-1291.